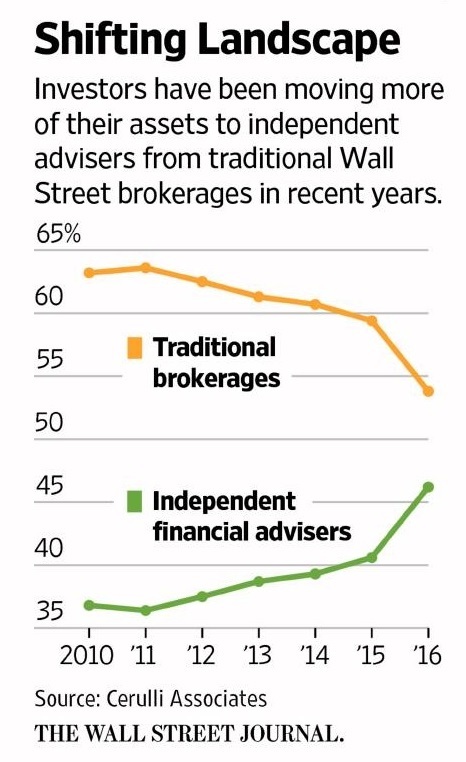 The graphic above, from Wednesday's Wall Street Journal, shows that traditional brokerage firms have been bleeding assets at an unprecedented rate over the last 7+ years at the expense of independent, fiduciary-minded financial advisory firms like Servo. In 2010, commission-based brokers (JP Morgan, Citigroup, Goldman Sachs, Merrill Lynch, Morgan Stanley, Wells Fargo, LPL, Edward Jones, and every bank brokerage department in your town) controlled almost 2/3 of investors' assets. For the first time in history, we might see that amount fall to less than 50% in 2017.